Here are three powerful reasons why loving yourself is the key to a good life – and why the world needs you to love yourself more now more than ever. Loving yourself is all about acknowledging your positive qualities and being kind to yourself. You spend less time berating yourself for your mistakes and perceived flaws with negative self-talk and more time celebrating your successes and building on your strengths. And if you’ve been following me for any length of time, you probably know that what you focus on grows. So when you focus on your successes and your strengths, the more successful and more capable you’ll become! And of course, that is going to increase your happiness, your satisfaction, and your enjoyment of life. Because a big part of loving someone is giving them what they need to thrive – mentally, physically, and spiritually. So when you love yourself, what we’re really talking about is practicing self-care and giving yourself what you need to show up in the world as your best self. Because when you show up in the world as your best self, you encourage others to do the same – and it creates a positive ripple effect that impacts the lives of many others. Not only that – when we love ourselves, we become so much better at loving others. We’re kinder to each other because we’ve learned how to be kind to ourselves. And I think we can all agree that the world today needs a lot more love and kindness in it. All right, so exactly HOW do you learn how to love yourself? Most people are chronically sleep deprived, which is a problem – because when you don’t get enough sleep, you’re more likely to get sick, become obese, suffer from depression, develop cancer, and put yourself at risk of a whole host of other health problems as well. So one of the nicest things you could ever do for yourself is to get the rest you need. I don’t care how much work you have, schedule several nights a week where you are going to go to bed earlier and get at least 8 hours of sleep. When you eat healthy food in the amounts your body needs, you have more energy and feel better about yourself. And you’re less likely to become sick. Eat fewer carbs and more protein and vegetables. It doesn’t have to be painful or strenuous – it can be as simple as doing yoga, tai chi, some basic calisthenics or going for a daily walk. Physical activity releases endorphins, boosts your energy and mood, increases your emotional resilience and improves your self-esteem. There are also a number of exercise videos you can buy, pop into your DVD player or your computer and just follow along. The key is to build it into your calendar at a specific time each day. Take time every week to celebrate your successes and remind yourself what you’re capable of achieving. Not only will it boost your confidence and self-esteem, but it will also motivate you to achieve more success in life. One way to do this is to keep a Victory Log where you write down your successes at the end of each day. No one is perfect. You’re going to make mistakes. Instead of berating yourself for them, use your mistakes as an opportunity to learn something that will help you get better results in the future. My sixth tip is to take time for yourself. Make sure to give yourself time every week to do something you love. Take a hot bath, read a book, watch a movie, spend time on your favorite hobby, or do something fun with a friend. Whatever fills your soul with gladness. Because you deserve it. And because in doing so, you will encourage others to do so as well. Again, put this into your schedule when you are planning your week, and then don’t let anything violate that space. You are capable of achieving anything you can imagine. The universe will not give you a vision that you can’t make a reality. All you have to do is take one small action after another and you can create any results you want in life. On a scale of 1 to 10, with 10 being high, how much do you love yourself, and what are some of the ways you practice self-care? Let me know in the comments below. Check out my free Guide to Positive Thinking. It doesn’t matter what you do for a living in or where you work – everyone is looking for productivity tips to get more done. Everyone is looking for ways to get their jobs done faster, easier, with fewer headaches. But, what if I told you that true productivity doesn’t just come down to making a task list and checking things off when you finish. It takes more than that. True productivity lies not only in how you manage your time – but in how you manage your mind. So follow these 5 uncommon tips to become an all-around more productive person. First, clean up your messes. When you live in a state of mental and physical clutter, it’s likely that you won’t be very productive. Incomplete projects, unfinished business, and piles of cluttered messes can weigh you down and take away from the energy you have to move forward toward your goals. When you don’t complete tasks, you can’t be fully prepared to move into the present, let alone into your new future. What this means is that in order to be productive, you must complete any unfinished business or tasks that have been holding you back. Next, focus! The most successful people create entire days dedicated to focusing. A Focus Day is a day in which you spend at least 80% of your time operating in your core genius, or primary area of expertise—interacting with people or processes that give you the highest payoffs for the time you invest. To be successful, you must schedule more Focus Days and hold yourself accountable for producing the results. The more you focus on your highest payoff activities, the more productive you’ll be. Third, learn how to say no. If you are going to increase your results and your income, as well as increase the amount of free time in your life, you are going to have to eliminate those activities, requests, and other time-stealers that don’t have a high payoff. You will have to structure your work so that you are focusing your time, effort, energies, and resources only on projects, opportunities, and people that give you a huge reward for your efforts. You are going to have to create strong boundaries about what you will and won’t do. Next, practice the Rule of 5. The Rule of 5 simply means that every day, you must do five specific things to move your most important goal toward completion. By committing to take meaningful daily actions to achieve your goals, you will accomplish more than you thought possible in a surprisingly short amount of time. Meditation is very important when it comes to productivity. In general, through meditation, you can do many things better. When your mind is clear, you make better decisions, you’ll be able to focus on your most pressing issues, you’re more creative, you have much greater awareness of the world around you, and you ultimately get more done. All these are great benefits.Pick one of these productivity tips and begin implementing it today. Leave a comment below on which one you are choosing to implement first starting today, and I’ll be sure to follow up with you. In order to be productive, you must also learn to plan and execute on your goals. Click the button below to download my free 12-month goal planner and get started. When you have high self-esteem and self-confidence you show the world the best version of yourself. Nothing is more important than the way you think and feel about yourself. You might think it’s odd that someone like me who’s been teaching success principles and self-esteem building methods for over 40 years could be shy, but I am – in many situations. It takes a lot of focus and energy for me to interact with businesspeople, legal teams, and advanced-level academics and not feel timid when voicing my thoughts and asking questions. If you’re interested in starting a mastermind group of your own, click the button below to get my Mastermind Workbook. I want to reveal something about myself that I hope will inspire you in your life. The truth is that the first time I earned a check for $1,000,000 was when I was 51 years old. It’s never too late to become a millionaire. In fact, if you consider that I graduated from Harvard University when I was 21, it took me an utter 30 years to amass the knowledge, the connections, and the experience required to generate that much money. Slow and steady won the game. How about you? What can you do in your life to develop the millionaire mindset? And I want you to realize today with everything that’s available on the internet, you don’t have to wait 30 years to become a millionaire. First, you must have the belief that you can easily become a millionaire. Belief comes from making a choice. All beliefs are thoughts. They’re thoughts you think over and over and over until you don’t even realize it’s a conscious thought anymore, it just seems like it’s reality. But you have the ability to change your beliefs. If you do the affirmation over and over, it becomes the new belief that becomes your reality and then everything in your unconscious mind and subconscious mind will start to organize itself to actually help you create it. The second thing is you must decide what being a millionaire means to you. These things that will keep you focused. Is it security? Is it freedom? Power? Prestige? The ability to travel anywhere you want in the world? Philanthropy? The ability to make a difference in the lives of others? Have the money to invest? Is it the ownership of a house, two houses, or a vacation home? Whatever that experience is for you, make sure that you write it down and get very clear what’s the why behind being a millionaire. For me, becoming a millionaire wasn’t about the big house and the big car. Now I have those things, but the real purpose for me was about having the freedom to pursue my visions and to live my life purposefully. To be able to hire staff. To have the electronic, video, and sound equipment at seminars. To be able to rent rooms, do PR, and pay for advertising. To be able to support my coaches. All those things that I wanted to do had to do with the vision of changing the world. I wanted to inspire and empower people to live their highest vision, so if everyone did, everything in the world would work. Make sure you get really clear about what is your purpose behind becoming a millionaire. Because that’s going to drive it more than the actual million dollars. It’s the feeling that you want to achieve and the impact that you want to have that is much more important. I suggest that you create a vision board of what you want and the pictures that would represent the lifestyle and experiences you expect to have when you’re a millionaire. A vision board is simple, it could be on your door, your mirror, or your refrigerator door. It could be on paper, construction paper, or wherever you want to put it. It’s simply a place where you staple, glue, tape, or however words like abundance, prosperity, freedom, travel, unlimited potential, and images. Be sure to include images of the vacations, the things you want to own, you on a stage, your children graduating, or whatever it might be that you think having a million dollar lifestyle would give you. We all have a financial set point just like the thermostat in your house. When we get to a certain level of earnings, our thermostat turns off the furnace, just like it turns off the furnace in your house when it reaches 68 or 70 degrees. And for some people making $75,000 a year is their comfort zone. They’ll never make more than that unless they reset their thermostat. You have to reset it. 40 years ago I got a new job working at a training company in Los Angeles and the owner of that training company said he was going to go buy some shirts if I’d like to come along with him. We went to a store called Allandale’s in Westlake, California and the cheapest shirt in that store was around $100. The owner was buying shirts for like $150. I had never bought a shirt for more than $38 from a place like Nordstrom’s. This was way out of my comfort zone to spend that much money on a shirt. I wanted him to think that I was successful so I bought one shirt that cost me $148. I’ll never forget this. I took that shirt home and I wore it and I sent it to the cleaners. When it came back, I noticed that it was always the first shirt I would reach for. It was a better quality shirt, it was designed better, it looked better, and it felt better. Pretty soon my comfort zone changed from $38 shirts to $150 shirts and those are the only shirts I buy now and I’ve bought ever since. The act of moving into a new place shifted my entire sense of myself and made me uncomfortable wearing the lesser quality shirt. Comfort zones are very powerful and you can change your comfort zone by visualizing, affirming, and taking actions in that new comfort zone that become a habit. Finally, you’re going to need to decide how much money you want to have in your life. The exact annual salary, the exact net profit from your business, your total net worth, your portfolio of investments, investment income, and how much you want to have when you retire. You have to believe it’s possible to attain that. Come up with a specific number. To stay focused on this number I want to teach you about a powerful tool which I’ve mentioned called affirmations. Affirmations are simply statements you repeat over and over and over affirming your new reality. Once you’ve created your affirmation, based on your goal and the numbers that you came up with, spend at least two to three minutes in the morning and two to three minutes at night repeating your affirmation every day. If you have three or four affirmations that’s great, go through them one at a time. Close your eyes and visualize having that reality. To help yourself develop a millionaire mindset and shift your comfort zone I want you to write several affirmations that are expressing your eventual income and lifestyle. Take a few minutes twice a day when you first wake up and right before you go to bed and repeat each affirmation. Close your eyes and see it clearly. As long as you’re intending it, even if it’s vague, it works. Make sure you visualize it as if it’s already come true and then feel the feelings you would feel. Fill in all the details of where you’d be, who else is there, what’s being said and as I said, most important, create the experience of the emotions you’d be feeling if you’d already achieved it. Just like an actor. Would it be joy, gratitude, happiness, pride, feeling powerful, or generous? Whatever you think you would feel, create that feeling in your body. Use these financial goals as your destination. Your financial goal is one of your important destinations, the affirmation and the visualization is the car you’re going to drive to get there, and the emotional feeling is the fuel that’s going to propel that car. Research seems to show now that the emotions are the most critical part of this process. Here is your millionaire mindset homework to complete after reading this blog. Pull out your checkbook and write a check payable to yourself for the amount of money that you want to make in the next year. Sign and date the check, and place it somewhere where you’re going to see it every day. Use it as a daily reminder of where you want to be, the work you want to do, and whatever is necessary to reach that goal. Put it on your mirror, your refrigerator, or under the glass on your desk at work. You could even photograph it and make it a screensaver on your computer. Leave a comment below and share one thing you’re going to do to ensure you reach the financial goal that you set for yourself within the next year. If you want to learn more about creating a vision board and creating affirmations that will change your life, click the banner below to get my free success tool, 21 Ways to Make Your Vision Board More Powerful. The Law of Attraction states that you will attract into your life whatever you focus on. Whatever you give your energy and attention to will come back to you. So, if you stay focused on the good and positive things in your life, you will automatically attract more good and positive things into your life. After watching the world’s greatest magician, David Copperfield, perform on television in Malaysia, Kabir found his calling to be a magician at 6 years old. Growing up, his passion grew and he could no longer keep it as a hobby. A copy of The Success Principles found its way to his hands and he was clear more than ever that he wanted to become the Malaysian David Copperfield. So he started carrying that demeanor and made a vision board. After attending one of my workshops, he tracked me down and told me of his dreams to study and perform in America. He changed his vision board even more to reflect that, and through his new mindset, persistence, and the vibrations he was putting out, he was able to attract a wealthy Chinese businessman through a mastermind group that was willing to sponsor him to study magic in America. He then had a friend mock up a newspaper article with the headline: “MALAYSIAN MAGICIAN TO PERFORM IN HOLLYWOOD” to add to his vision board. I’m sure you can guess what happened after that. After a year of visualizing and taking out-of-the-box actions, he received an invitation to perform at The Magic Castle in Hollywood. After seeing the film The Secret, my explanation of the Law of Attraction made Daniel understand the power of his intentions, goals, and focus at a new level. He decided to apply that to the dream home he wanted in Maui. He made the best offer he could make when it went on sale, but it was so low, the bank didn’t even counter. The highest bidder fell through and the bank lowered the price of the house. So Daniel got serious about what he truly could afford and what he felt was the right price for his family, and it was still too low. My words, “everything you want also wants you, but you have to take action to get it” resonated with him and his family. So as crazy as it sounds to most people, he and his family put a visualization practice in action. Almost every day, they would drive up to the house’s driveway, park, and act as if the house was theirs. He would wave hello to his family as if he were coming home from work, they would plan where furniture would go, and they would sit on the back deck to look at the horse enclosure and imagine their horse living with them again, instead of being boarded at the stable nearby. He then read The Success Principles and his conviction level skyrocketed. He felt truly on track for success. After paying to have the house inspected before its second auction, he no longer felt anxious and obsessed. He was calm and at peace, knowing he was doing everything absolutely possible to get the house. Then what do you know? The higher bid fell through again and the bank called if he could raise his price by $15,000. Daniel stood by his bid saying that’s the price that’s right for his family. A few days later, he received a call that the bank verbally accepted his offer! Sharon immediately became a believer of The Law of Attraction after watching The Secret while eating pizza, and hearing about my story of placing a $100,000 check of the money I wanted to manifest within 12 months above my bed. She put out into the universe that the next time she would eat pizza, it would be at 1pm at Venice, Italy on May 1st, her birthday. She really loved pizza, so you can imagine how much of a big sacrifice that was! She started telling everyone about her request, not caring if people thought she was crazy because she knew it was going to happen. She built a vision board of the canals of Venice and printed out a photo from the hotel she wanted to stay at of a window overlooking a terrace and a canal. In January of the year she set out to go to Venice, someone she had met earlier and heard of her request, offered to give her a ticket to Venice with no strings attached. Then after learning the hotel she wanted was booked for a conference, she believed the universe would deliver and called back two weeks later to find a room available. Turns out, it was the room where the exact picture on her vision board was taken. I hope you feel empowered by these stories. In order to unleash the full power of the Law of Attraction like in these stories, you need to take action. The Law of Attraction doesn’t work by just sitting there and wishing for these things to come to you. So I want you to just start by creating a detailed list of every step you’ll need to take to achieve your goals. I guarantee this will make it easier to move into action. To hold you more accountable, feel free to share your action plan with me in the comments and I’ll be sure to follow up with you. If you want to learn how to master your thoughts and emotions to make your dreams and goals come true, click the button below to download my free guide on activating the Law of Attraction in your life. Learning how to become a coach will help you become a powerful force to leave a positive impact on the world. If you lead a team of people or need to walk a co-worker, student, or friend through a rough patch in their life, having the ability to coach others to success is a useful skill. One of my goals is to train 1,000,000 people to teach my Success Principles to groups around the world. Whether you’re a teacher, manager, business owner, minister, local baseball coach, or someone who wants to hold a lunch-and-learn at the office, YOU can learn to coach others. I’ve assembled strategies and developed them into exercises anyone can use in training groups. I teach these techniques all over the world and use them myself. One of the most powerful exercises that I teach my coaches is the “Difficult and Troubling Situation”. You can use it as well to help others in nearly any setting. It’s a series of questions designed to get someone unstuck and into action. It solves their problem by removing the roadblock that’s keeping them from producing the results they want. This exercise can either be used one on one with someone or in a workshop with a large group. This exercise will help you as a coach identify someone’s problem, and help them solve it. The key is to ask these questions in the correct order without engaging in any discussion or commenting. Your role as the coach is to to ask the questions and let the questions do the work. At the end of this, you’ll be able to identify roadblocks that a person has and provide solutions for success. Let’s go over the questions. 1. What is a difficult or troubling situation in your life? Ask the person you’re coaching to think about a place in their life where they feel stuck. Where do they feel that they’re not getting what they want, are irritated, or feel like they’re not happy. Perhaps they’re upset that their child is not doing what they need to do. Maybe their marriage isn’t working out, or there’s something going on in their business. Whatever the problem is, the first thing is to identify it. 2. How are you allowing it to happen? The second question is: How are you creating it or allowing it to happen? The person who you’re coaching to success must realize that everything you experience YOU create. You create the life you want. You’re responsible for everything that you’ve allowed it to continue. 3. What are you pretending not to know? In every situation where we’re not taking action, we almost always know how to fix it. We know what to do but we’re pretending not to see it. In a recent workshop, I coached someone whose apartment gets robbed frequently. They live on the first floor of their apartment building in New York. I told him the answer is you’re pretending not to know that you live in New York. In New York, you need those kind of safety measures to keep from getting robbed. There’s usually something we’re pretending not to know. We pretend because it’s inconvenient. It’s uncomfortable to notice a problem, because then we’d have to do something about. Ask the person what they’re pretending not to know, and get your answer. 4. What is the payoff for keeping it like it is? No person maintains a situation without some kind of payoff. When you were going to school as a kid, if you got sick there was a payoff. The payoff was that you didn’t have to go to school. You got to stay home. You got to watch TV all day. You got the attention of your parents and other things. Whatever the problem is, there are payoffs for keeping things the way they are. The payoff might be to avoid conflict, it might be comfort, or it might be not having to confront somebody. Identify what it blocking the person from change. 5. What is the cost for not changing it? Every situation has a benefit and a cost. What is the cost that you’re going to pay by not changing your situation? Often the cost will be, your freedom, income, happiness, joy, or not being overwhelmed. You may be sacrificing a lot by holding onto this troubling situation. 6. What would you rather be experiencing? I’d rather be experiencing freedom. I’d rather be experiencing having more free time. I’d rather experience more success. I’d rather experience feeling stress free at the office. Whatever it might be, have the other person think about all the great things that can come from solving the problem. 7. What actions will you take and what requests will you make to get it? This involves action. How will you get there? Do you need to do or ask for something? Do you need to set a boundary? What do you need to do to get what you want. This is the most important question. It requires a person to get out of their comfort zone and do the things necessary to create what they want. When they answer that, make sure you write it down. 8. By when will you take that action? You want them to commit to a time by when they will take that action. If possible, you can be their accountability partner. So now they know that someone is waiting to make sure they took the action. This is a powerful tool to coach others to success. I’ve used this in all my groups, all my coaching programs, all my mastermind groups and when I teach others how to become a coach. People often tell me that this exercise changes lives. Make sure to ask the questions listed in the order they appear. Don’t engage in a lot of discussion, your role is to simply to ask the questions. Make sure you maintain eye contact throughout the exercise. Identify a person who you think you could help by using this strategy. Reach out to them and offer to take them through these questions. You never know how impactful it could be for the other person. And if you want, turn the tables. Have them take you through it as well. You’ll get a lot of value by doing it both ways and it creates a feeling of equality between you and the other person. It shows you’re not above them or below them, but that you’re equal partners. Try this with your friends, family, and coworkers – it is a really powerful technique. This is the same methodology I teach to my students in my Train the Trainer Certification Program. 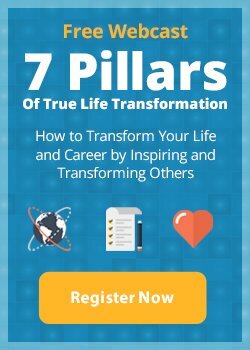 If you’d like to learn how to become a coach and Transformational Trainer – and take your own speaking, teaching, or training career to the next level – I’m accepting a new group of students who want to become Certified to teach my Success Principles and join the ranks of the next generation of Human Potential Trainers. Click here to learn how you can become a Certified Canfield Success Principles Trainer. If you have any comments or questions about Transformational Training, please post them in the comments below! Learn to create lasting, positive, change in the lives of the people when you learn how to become a coach. Use my proven methodology to inspire and transform others and learn to how to create experiences in others that will empower them to break through barriers. Get this free guide by clicking the button below. I wanted to write you a quick note from gorgeous Italy! I’m at a private mastermind retreat with 26 incredible, like-minded participants who have joined me at a 17th-century villa in Tuscany for the advice and support to make their most ambitious goals a reality. Some of them are here because they want to create an action plan that will take their business to the next level – while others are looking to find more joy, meaning, and harmony in their busy lives. “Dragon’s Den” star Sean Gallagher and Patty Aubery, the business mastermind behind my own multimillion-dollar company, are also here to share their brilliance with the group. Needless to say, the energy here in the villa is amazing! One of the best things about my life is being able to live and conduct business anywhere in the world. I’ve held private mastermind retreats in Hawaii, Bali, Dubai, and Italy. And every time, I’ve found that when we do transformative work in a beautiful, uplifting environment, the results people get are just incredible. CARE TO JOIN ME FOR MY NEXT PRIVATE RETREAT IN A BREATHTAKING LOCATION? I conduct my private small-group retreats only once or twice a year – and the next one is taking place this October 9-12 in my hometown of Santa Barbara, California. Of all the beautiful places I’ve visited in the world, Santa Barbara is the one I’ve chosen to call home. With its breathtaking beaches and world-renowned vineyards, there’s a reason it’s called the American Riviera! Please note that Santa Barbara is the last private retreat I will be hosting this year. Also, I wanted to let you know that I will be scaling back on live trainings in 2018, so I’m not sure when (or if) I will be hosting any private retreats next year. So if you’ve ever dreamed of working one-on-one with me and getting the expert mentorship you need to launch YOUR project, business, or personal mission in the world, now is the time to take action. Click here to learn more about this powerful private event. If you’re interested in attending this exclusive event but would like to talk to someone in person to learn more about it, give my Live Events team a call. They’ll be happy to discuss flexible payment options with you and answer any questions you have. You can email my team at: retreathelp@jackcanfield.com or call us directly at: 805-881-5192. Please note that the Italy retreat I’m currently hosting sold out faster than expected – in fact, there was a waiting list for it! Last year’s retreat in Santa Barbara sold out faster than expected as well – and I’m fully expecting this one to do the same. So if you’re interested in attending, I encourage you to act fast. Now I must go – it’s time for me to spend some time relaxing on a patio overlooking the Tuscan countryside! Learning how to show appreciation daily for everything is one of the highest emotional states you can experience. Many people find that it requires great diligence to cultivate a persistent attitude of appreciation. That’s because we’ve been culturally conditioned to focus on what we don’t have, rather than appreciation for what we’ve already received and achieved. When you make being grateful a habit, you’ll feel true joy and contentment, no matter what you have or don’t have in your life. And since the Law of Attraction states that like attracts like, being grateful will naturally attract more into your life that you can be grateful for. When you learn how to show appreciation, it’s a never ending cycle of positivity! We do dozens of things every day on autopilot, such as eating our meals, taking showers, or doing the dishes. We don’t have to spend time visualizing these activities or putting them on our to-do lists. We simply do them out of habit. Playing The Appreciation Game on a daily basis is a great mindfulness training and will help you turn gratitude into a daily habit, so you can attract more joy and abundance into your life all year long. First, set a specific time each day to consciously appreciate everything you encounter. An ideal time to do this is on your way to or from work. Second, appreciate the people you pass, the road you walk on, the cars that let you merge into a different lane, the street signs that make it easy for you to know where you’re going, the rain that’s nourishing the plants and trees, and so on. Third, look for the good in all situations – even those you would normally view as negative. As the saying goes, “Every cloud has a silver lining.” For example, when my wife was in a car accident a few years ago, she could have chosen to berate herself or question her judgment. Instead, she learned how to stay focused on her gratitude for suffering only minor injuries and for the help she received from other drivers. Remember, new habits take 30 to 60 days to lock in. Express your appreciation to at least 10 people a day, both individuals you know intimately, as well as virtual strangers who touch your life. Experiment with the different forms of appreciation and observe how much more deeply your appreciation is received when you find the right way to deliver it for each individual. Then keep track of everything you’ve appreciated on your scorecard. I don’t go to bed without achieving my daily appreciation quota. I appreciate my wife and children, write letters to my mother or stepfather, or email my staff. Do this every day for 6 months or until you no longer needed the card as a reminder. As you build the habit of appreciation, it helps to expand the circle of people whom you appreciate. Think bigger. Our society flourishes because of connections. We literally couldn’t survive without other people. Nobody pumps their own petroleum, turns it into gas, and trucks it into their own town. Other people do it. The food we eat probably has 30 to 40 people involved in it before it gets to our tables. Although they may be strangers, the people who serve us by doing their part in making our society function deserve our thanks, too. Grab an index card, a journal, or keep a note in your phone to start writing down at least 10 things you appreciate daily for the next 30 days. It may not feel natural at first to focus on appreciating what you already have, especially when you’re first learning how to show appreciation. But by faithfully practicing The Appreciation Game, you’ll begin to change your conditioning. And to help keep you more accountable, comment below how you plan on building an attitude of gratitude and I’ll be sure to follow up with you. Coloring fans – INKSPIRATIONS is now available! I’m delighted to announce that my new coloring book for adults is now available for purchase! INKSPIRATIONS – The Power of Positive Inking: Color Your Way to Success combines the benefits of coloring with 30 of my most powerful Success Principles to inspire you, boost your creativity, and increase your motivation and mental focus as you work toward your goals. If you find it hard to quiet your “monkey mind” and relax at the end of the day… if you frequently find yourself suffering from stress or overwhelm… or if you’re looking for ways to flex your creative muscle and feed your soul, this book was created specifically for you. I have some BIG NEWS to share with you today! I’m going on a four-city tour this fall to share a powerful new one-day training workshop that will change your life – and I would love you to join me. If you live in or close to Chicago, New York, Dallas or Florida and you have a strong desire to transform your life and reach incredible new levels of personal and professional success, I encourage you to book your seat ASAP. During One Day to Greatness: Live with Jack Canfield, you will have the rare opportunity to spend a full day with me, learning my proven strategies to unlock your full potential and accomplish GREAT things. You will be amazed at how much your life can change in a single day! I will guide you through a series of experiential lessons and interactive exercises that will help you absorb my most powerful success strategies at a deep internal level – so you can manifest immediate results and send your life on a completely different trajectory from the one you’re on now. I’ve spent over 40 years teaching, writing books, coaching amazing people, and conducting workshops that have helped thousands of people achieve their most ambitious goals. During this time, I’ve learned what strategies work best for people from all walks of life and have refined and perfected these principles so anybody can use them to create the life of their dreams. I am so excited to share them with you in person! I expect to enable you to boost your income, experience new levels of happiness, deepen your most important relationships, get clarity on your goals and next steps, connect with your gifts and talents, and reach your full potential. Isn’t that what life is all about? You deserve to have and be exactly what you want, so let me help you get there! I challenged my team to make this event more affordable than ever for members of my community. I think they have definitely delivered on this challenge. You can attend my full-day workshop, live and in person, for only $149! That’s it. Yes, the regular ticket price is a bit higher at $299, but use promo code: GREATNESS and you’ll save 50% off the regular price as long as seats are available. This discount is also available for VIP tickets, which will sell out quickly. So if you’d like to enjoy one of the best seats in the house and join me for a private luncheon and Q&A session, grab your VIP ticket today. I’ve set aside this day to invest in you. Will you do the same? Will you invest one day in yourself and join me for an unforgettable experience of unleashing your full potential and enabling a new level of success? I look forward to partnering in your success – and the achievement of your wildest dreams. Earlier this year I co-authored a book called The 30-Day Sobriety Solution with Dave Andrews. Sobriety is very important topic for me as it’s something I’ve watched friends and family struggle with more times than I ever imagined possible. Due to the overwhelmingly positive response to the book — and request for support– Dave and I have decided to host a FREE 30 Day Challenge and I’d like to invite you to join us! Once you register we’ll email you daily action steps, tips, videos and inspiration during the 30 day challenge. You can also join us on our 30-Day Sobriety Facebook Page for daily inspiration, sharing your wins with us, and connecting with others. Our goal is to support you for the next 30 days with any difficulties you may face during the challenge. Why not invite your friends, family, or even coworkers, to participate in the challenge together and see how it can collectively transform your lives?! And remember, you don’t have to be a problem drinker to participate! Whether your desire is to achieve total sobriety, or permanently cut back, or just lose some weight and improve your health, this is an opportunity to do that.